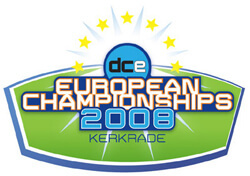 Twenty drum corps will take the field this Saturday, Sept. 27 in Kerkrade, the Netherlands, as they vie for the 2008 Drum Corps Europe (DCE) Championship title. Corps representing the United Kingdom, the Netherlands, Germany, Belgium and Italy, will compete in the one-day event. For the first time ever, Drum Corps Europe will be testing live Webcast technology to bring fans around the world coverage of the Saturday performances. The live video stream will begin at 4 a.m. Eastern time (10 a.m. local time). Visit DrumCorpsEurope.org/webcast to watch the event. Among the performing Open Class groups at the Championships will be Beatrix, the Hilversum, Netherlands-based 2007 DCE silver medalist. Beatrix completed a three-week tour of the United States this past August competing as part of the 2008 Drum Corps International Summer Tour. The corps was the uncontested International Class Champion at the '08 DCI World Championships in Bloomington, Ind. In the video clip above, the Beatrix drum line kicks off the start of the DCI Eastern Classic awards ceremony in Allentown, Pa. Learn more about the DCE World Championships at DrumCorpsEurope.org.